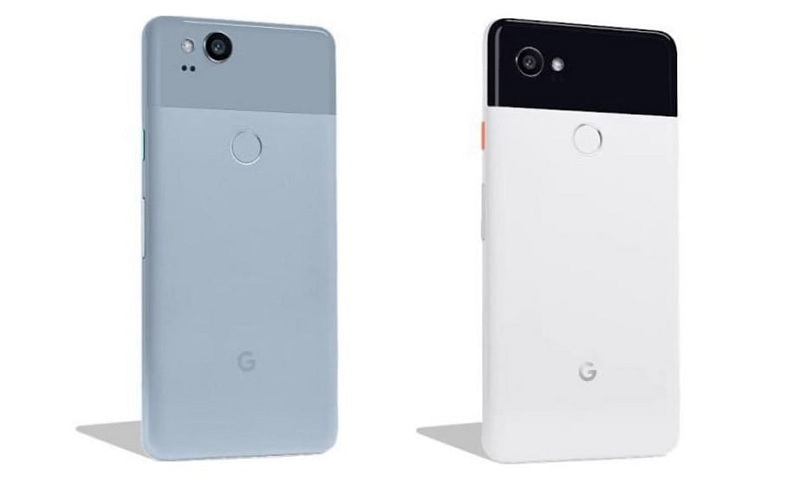 Leaked images of the blue Google Pixel 2 on the left and the white and black Google Pixel 2 XL on the right, first published by technology site Droid Life. Google is set to release two new smartphones, the Pixel 2 and Pixel 2 XL, as well as a smaller Google Home Mini smart speaker on 4 October. The devices will be released at the Made by Google event scheduled to take place in San Francisco and will lead the company’s renewed hardware efforts as it attempts to take on Apple and Samsung in the premium smartphone and accessory market. Two variants of the Pixel smartphone will be released mirroring last year’s devices. The smaller Pixel 2, which is expected to have a screen about 5 inches in size, will be made by smartphone manufacturer HTC – part of which was acquired by Google on Thursday – according to two sources. It will come in blue, black or white and have a metal and glass back, similar to last year’s Pixel. The larger Pixel 2 XL will be made by LG and resembles an LG G6 on the front with an almost bezel-free screen, according to two sources, who added the phone will come in black or white with a black top and a glass panel at the top. Both Pixel 2 smartphones will have Qualcomm’s Snapdragon 835 processor, according to two sources, as well as 4GB of memory and either 64 or 128GB of storage. Both smartphones will also have pressure-sensitive sides, according to two sources. HTC introduced the feature with its U11; Google is likely to use it to launch its virtual assistant. Google’s 2016 Pixel smartphones won awards for their cameras, using Google’s HDR+ mode. The 2017 Google Pixel 2 smartphones will both have an improved single 12-megapixel camera on the back using similar computational photography techniques, two sources have confirmed. Neither smartphone will have a headphone socket, instead relying on the USB-C port for audio out, but both phones will be water resistant – a new feature for this year that brings them into line with rivals – according to one source. Three sources say the cost of the Pixel 2 and Pixel 2 XL is still to be confirmed, but they are expected to be priced similarly to last year’s Pixel and Pixel XL, which cost £600 and £719 respectively. Alongside the Pixel 2 and Pixel 2 XL, Google will also unveil a smaller Google Home smart speaker. The Google Home Mini will be a direct Amazon Echo Dotcompetitor, taking the voice assistant functions of the Google Home and shrinking them down into a smaller fabric puck shape, two sources said. Similar to the differences between Amazon’s full-sized Echo and the Echo Dot, the Google Home Mini will not have the same speaker quality as the larger Google Home, but will perform most of the same functions through Google Assistant. It is expected to cost about £40-50, according to one source. Google is also rumoured to be unveiling a new high-end Chromebook called the Pixelbook, which supports an optional stylus, but the Guardian has not yet confirmed its existence. Google is set to release two new smartphones, the Pixel 2 and Pixel 2 XL, as well as a smaller Google Home Mini smart speaker on 4 October, the Guardian has learned.